Secondary cataracts are treated using a YAG laser. It is a brief and painless outpatient procedure. There is no need for anesthesia or incisions. 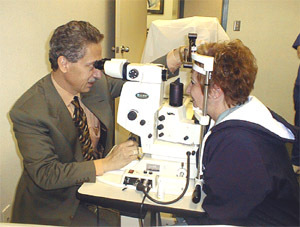 The pupil will be dilated at the time of the procedure. The laser makes a new clear pathway in the area of the pupil, allowing light to reach the back of the eye. You will usually notice an improvement in vision as soon as the pupil goes back to its normal size. The procedure takes approximately 5 minutes and there are no post-operative restrictions. You may notice spots or floaters in your vision after the procedure. This is normal and will become less noticeable as they become absorbed by the eye.